Cliffs, coves, lagoons, sea-stacks and long sandy beaches. 3 miles north of Orick via Hwy 101, then 5 miles west on Davidson Rd. in Prairie Creek Redwoods State Park. A brief nineteenth century gold rush gave the beach its name - gold was panned from sands of the beach itself. Five prospectors discovered gold dust in the sand and staked a claim. The campground lies in the dunes along a beautiful 10-mile stretch of the golden beach. 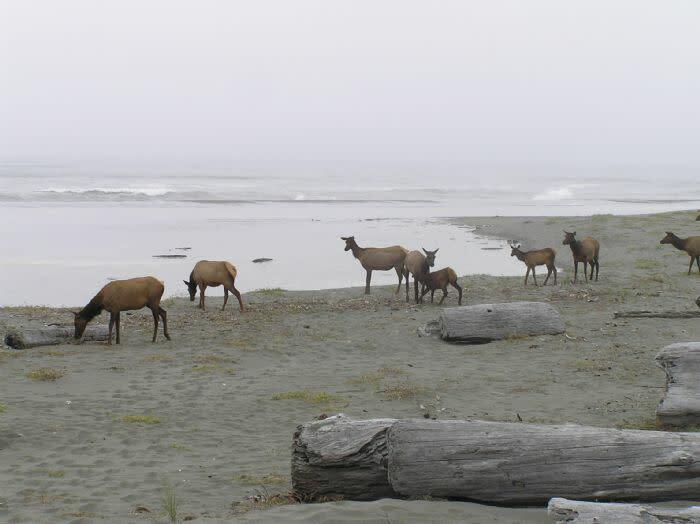 You may find yourselves to be just about the only people around, aside from the herd of Roosevelt elk that are often seen in a meadow near the campground. The campground has running water, flush toilets, solar-heated showers and a fire pits. To access the park you travel down a narrow, gravel road where trailers are prohibited and RVs must not exceed 24' long or 8' wide. There are 24 tent or RV sites and one hike and bike site. Access from parking lot at Trinidad Head. You'll find tidepools at low tide where a wealth of sea life can be viewed. Sea kayakers enjoy exploring this stretch of coastline. The Trinidad area is one of the most spectacular and pristine segments of the California coast and has been established as a California Coastal National Monument Gateway--an area that offers the best shore-based opportunities to discover and view offshore rock and islands and their inhabitants. 2 miles south of Trinidad on Scenic Dr. Heading north toward Trinidad, take the Trinidad exit. Head west on Main St. and then turn left onto Scenic Dr. Follow Scenic Dr. for 2 miles. Luffenholtz Park offers a sweeping overlook of the Pacific Ocean with a picnic area and trail down to the beach. This is a spectacular rocky cove with tide pools and wildlife. New visitors to Agate Beach are often perplexed by the sight of people walking slowly with their heads bowed, intently studying the ground as though they've lost a contact lens, or of other people sitting down and methodically sifting through the beach gravel beds. What are they looking for? Oysters? Clams? Pirate treasure? The answer is implicit in the beach's name: agates. The translucent, semi-precious stones are regularly churned up by the powerful waves, and many folks make a habit of visiting the beach on a regular basis in search for these rocks. Even more precious moonstone and jade are found at times, as well as the more expected flotsam of shells, driftwood and the occasional fishing float. But beachcombing is just one of the attractions of this long, remote beach. College Cove: Stagecoach Rd. off Hwy 101 at Trinidad exit. Follow trail and stairs to the cove. There is a natural arch near the north end of the beach. Low tide is the best time to visit. College Cove is a popular beach with sheltered waters that are safe to enter under the right conditions, in addition to having fascinating rocks and tide pools to explore. Heading north on Hwy 101 to Trinidad, take the Scenic Dr./Moonstone Beach exit. Turn left onto Scenic Dr. then turn left on Moonstone Beach Rd. Little River State Beach features dunes and a broad open beach. The beach is bordered on the north by the Little River and on the south by Clam Beach Park, which provides camping and day use facilities. The little River separates the State Beach from Moonstone Beach, and the river itself offers great kayaking and swimming. 7.5 miles north of Arcata (near McKinleyville) off Hwy 101. Exit at Clam Beach Park off-ramp. Very few parks in California allow camping right on the beach, but Clam Beach County Park is one of them. A wide and long stretch of flat shoreline, Clam Beach is part of a continuous ocean frontage that connects with Mad River Beach County Park to the south and Little River State Beach to the north. It is just minutes away from the town of McKinleyville, where all of your picnic, camping and beach supplies are available. Clam Beach also features beachcombing, clamming and fishing. 5 miles northwest of Arcata, exit west on Giuntoli Ln. and follow signs. 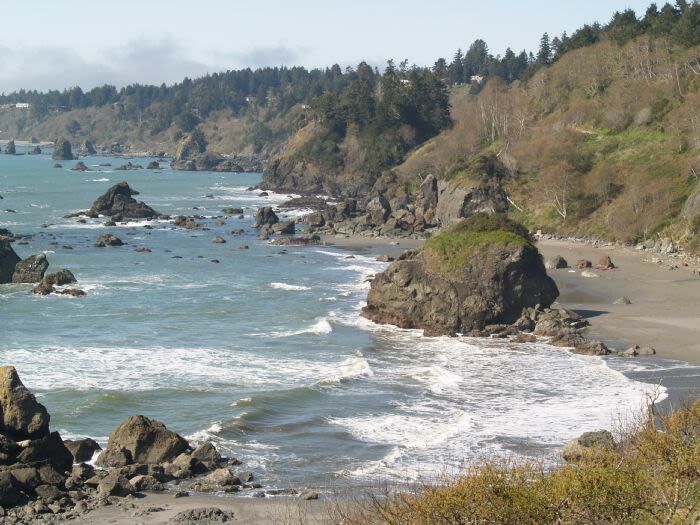 This is one of the Redwood Coast's best beaches for picnics, beachcombing and fishing. Mad River County Park is composed of two parts: one part is the beach, with coastal dunes and grasses behind the wave slope; the other part is a large parking area with a boat ramp into the Mad River. Just a couple of miles from where it joins the Pacific, the river here has a strong tidal influence, but even at low tide the river is deep enough for paddling canoes and kayaks either up- or down-stream. The fishing and wildlife viewing is excellent. There are no day use fees for the use of the beach or boat ramp. From Eureka, turn west on Hwy 255, cross Samoa Bridge; 5 miles south on New Navy Base Road. Also known as the North Jetty. 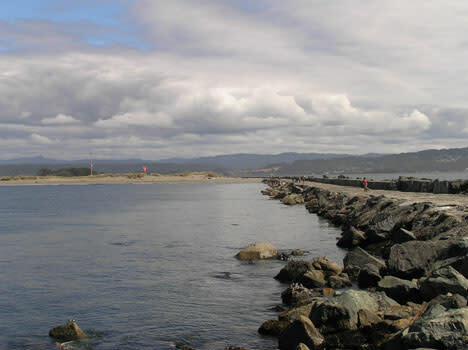 The park features a boat launch (into Humboldt Bay) and camping facilities. The area is great for clamming, fishing and beachcombing. The park makes a convenient RV camping spot, especially for OHV (Off Highway Vehicle) enthusiasts. On the ocean side of the Samoa Peninsula, there are literally miles of beaches to explore. These beaches are popular with surfers, kite flyers and those seeking solitude. The north Jetty is one of the most interesting and unusual places on the north coast. Traveling south on Hwy 101 take the Ferndale exit. Continue south; turn right onto Fernbridge and travel through the town of Ferndale. Turn right on Ocean Ave. from Main St. and proceed 5 miles on Centerville Rd. to Centerville Beach. The park provides access to 9 miles of ocean beach. Dairy farms back the wild beach to the north and steep cliffs are to the south. A large cross overlooks Centerville Beach. The cross memorializes travelers who died when a steamer sank offshore in 1860. Sandpipers scurry along the water's edge and cormorants, gulls, and pelicans fly along the water. Harbor seals can be seen peering curiously from the breakers. From mid-November to March, one of the largest coastal congregations of Tundra Swans can be found in the Eel River Bottoms north of Centerville Rd. Accessible two ways: take Hwy 101 to Garberville, South Fork/Honeydew or Ferndale exits. Follow signs to Petrolia; turn on Lighthouse Rd. to the ocean. 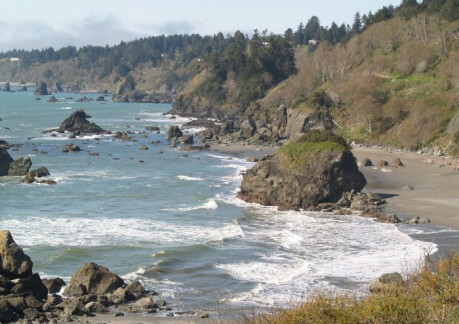 This route will take you to the northern tip of the Lost Coast. Or, located off Hwy 101, 16.5 miles west of Garberville on Briceland/Shelter Cove Rd. This route will take you to the southern end of the Lost Coast. One stretch of California coastline that is largely untouched by major highways and towns is the 60,000-acre King Range National Conservation Area. Extremely steep and rocky terrain extends to the beach. The beach is narrow, and at some points it disappears under rockslides or at rocky points that jut out into the surf. The remote region is known as California's Lost Coast, accessed by only a few back roads. 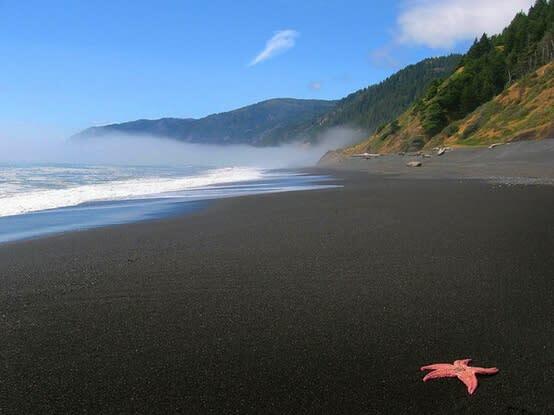 A 24-mile section of the Lost Coast Trail leads north from Black Sands Beach (near Shelter Cove) to the Mattole River, along the wilderness beach. This is a rugged hike, not a simple walk on the beach, and is one of the few coastal wilderness-hiking experiences in the U.S. Please note: Ocean swimming on the North Coast is very hazardous! Even when walking or wading, never turn your back on the surf. Please stay alert, be safe and have a great time..